Join me on Human Rights Day, December 10, 2014, from 8-10 PM Eastern for a conversation with Katherine Hine and to hear how you can be part of helping free John Rohrer. Call (267)521-0167 to be a part of the program. Katherine Hine is an inactive attorney in Ohio and mother of John Rohrer, the 34 year old writer/musician being kept locked up in state facilities since September, 2009, force drugged for more than 3 ½ years. 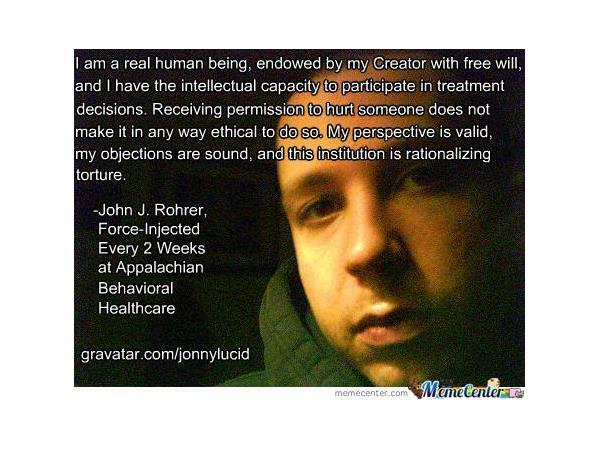 Thanks to support from the Anti-Psychiatry movement and lawsuits involving 5 separate courts in Ohio, John, as of November 4, 2014 is no longer forcibly drugged. But he remains hospitalized by the very people who have been battering and retaliating against him for the past 2 years. Support from the human rights community is more needed today than ever, as John and his attorney attack Ohio’s mental health SYSTEM in the courts of its state capital. A demonstration is planned for January at the State House. On December 10, 2014, Human Rights Day, it may be timely to reflect on some of the rights we all as citizens still have on paper, and what that really means in practice in America today. For a more complete story, with comments, go to http://www.madinamerica.com/2014/12/patients-lawsuit-claims-psychiatric-diagnosis-treatment-fraud-malpractice-torture/#more-50533.